Huzzah! I finally have a completed project to share! I took advantage of all of the time spent in the car and on planes while traveling this past month to finish up the On My Wavelength project I started late last month. The pattern itself is pretty easy to follow and I found myself getting into a nice rhthym with it. As I mentioned in my last Knit Nook, the Moebius cast-on was a bit tricky for me to learn and I relied heavily on a wonderful target=”_blank”>instructional video by Cat Bordhi to get it down. It’s definitely not perfect and I had to sew up a hole left in my cast on as well as one dropped loop (oops! ), but aside from those things, I think it turned out pretty well. 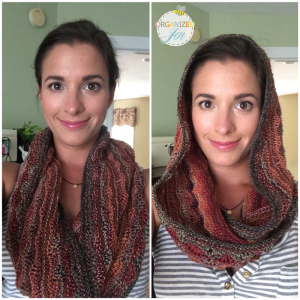 The finished result is an airy cowl that lays beautifully on and can easily be pulled up for a hooded effect. For a cozier feel, you can double it up around your neck. I really like the Dyed in the Wool yarn from Spincycle that came with the December Indie KnitCrate (and this pattern). The colorway is called Rusted Rainbow, which is an apt description on the gorgeous spectrum of autumnal colors. Combined with the undulating wave pattern, the effect is a lovely warm-toned piece that is perfect for fall. I managed to refrain from purchasing any new knitting supplies as I already have well more than I can manage between my KnitCrate goodies and past hauls. 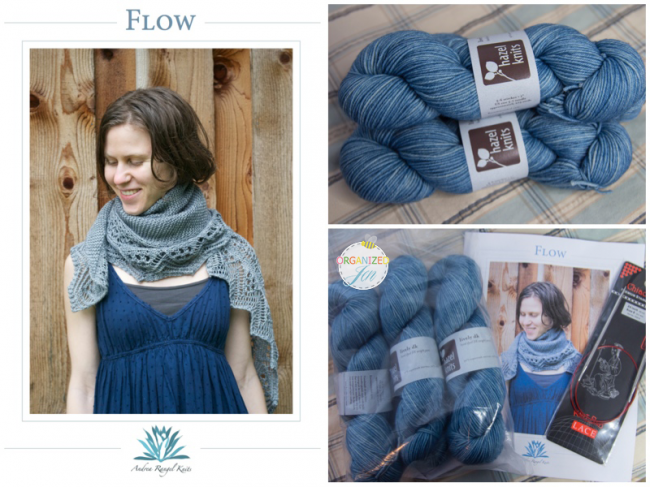 Now that I’ve finished the cowl, I plan on starting the Flow pattern by Andrea Rangel that I purchased back in April along with three hanks worth of the Lively DK in Cornflower by Hazel Knits and Size 8 Red Lace Circular Needles by ChiaoGoo. I can’t wait to get started on this gorgeous shawl! I also plan on continuing work on knitting hexipuffs for the Beekeeper’s Quilt. I didn’t knit any this month as I dedicated all of my knitting energy towards the cowl. I absolutely love KnitCrate, which is a monthly (or bi-monthly if that seems like a bit too much yarn coming at you) subscription service geared towards knitters. There are eight different subscription options, which you can see here if you’re interested. I subscribe to the Beginner’s KnitCrate, which includes a pattern suitable to that level, enough yarn to complete that project, a couple of bonus items (ranging from soothing to sweet to fun), and promo codes for knitting related products. It’s basically the most awesome care package a knitter could ever dream of! This month, the kind folks over at KnitCrate reached out and asked if they could send me the Indie Exclusive KnitCrate instead of the Beginner’s one, since they thought I would enjoy it. 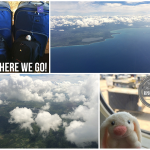 What’s in my June KnitCrate? 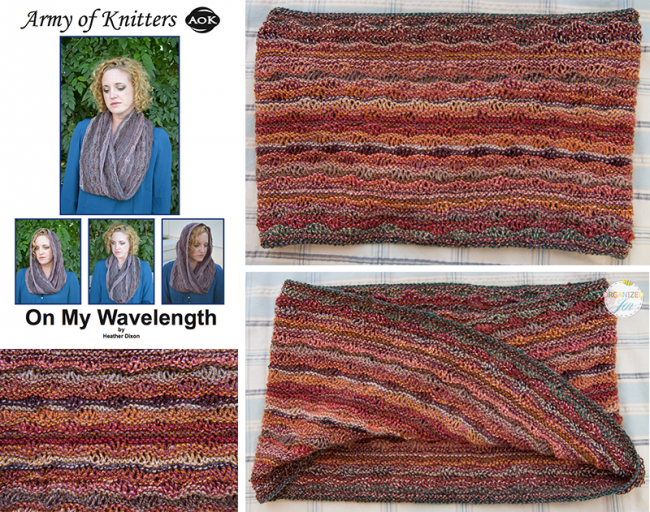 ✻ Faraway, So Close By Carina Spencer – Described as a “simple shawl that uses repetition of various stitch patterns to achieve a more complex effect,” at first glance this pattern seems a bit over my head and I am wondering if the folks at KnitCrate overestimate my knitting abilities! We’ll have to see! Luckily, the pattern itself is very clearly laid out with easy to follow instructions, which is always helpful for newbies like me. ✻ Blue Moon Fiber Arts Targhee Worsted – At 825 yards, this is quite a bit of yarn! I love the gorgeous colors in this exclusive colorway called Stalking the Wild Blueberries. The included contrasting yarn is called Nyame. These colors will make for a gorgeous shawl using the accompanying pattern! ✻ Crimson Orchid Designs Stitch Markers – The fun extra this month is a set of gorgeous handmade crystal stitch markers. They are so much prettier than the plain rubber ones I’ve been using! What a beautiful little stash to add to my knitting supplies. ✻ Handmaid Hand Cream by Soak – This lovely hand cream is the sweet extra this month, featuring Aquae, a fresh scent that is perfect for summer! Hand cream is a nice gift for knitters. 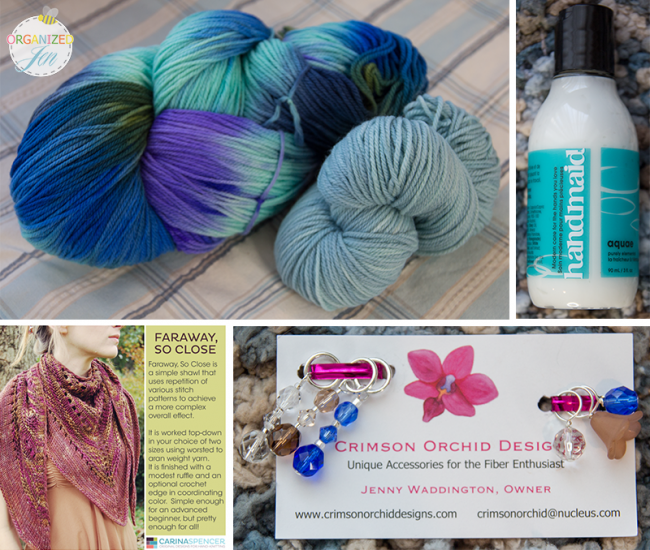 ✻ Promo codes also included for Carina Spencer patterns, Crimson Orchid Designs products, Molly Conroy Designs patterns, Soak orders, and Blue Moon Fiber Arts yarn. I also subscribe to the 5 Mini Add-Ons package available through KnitCrate. Each month I receive five 30-yard mini hanks in hand painted/indie dyed yarns. It’s a nice way to try out a variety of hand-dyed yarns from different providers. I use the mini hanks I receive through this subscription for the Beekeeper’s Quilt. 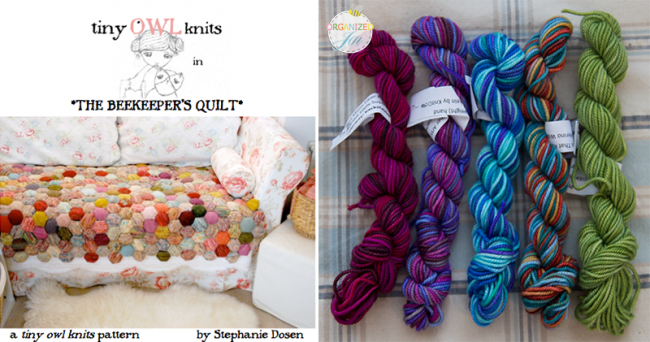 This month’s selections include five bright colors from Blue Moon Fiber Arts. This hand painted Socks That Rock made from merino wool is so vibrant! I am happy to announce that KnitCrate has very generously offered an Indie Exclusive KnitCrate package like the one I received as a prize for one of you! 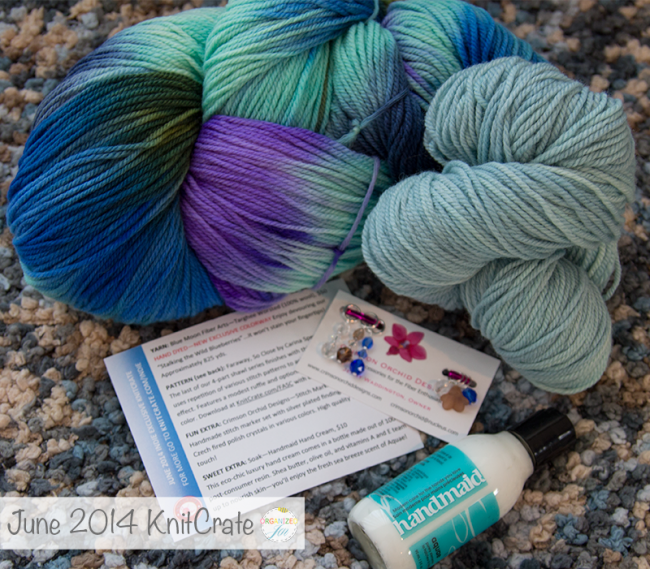 The June 2014 KnitCrate Giveaway will run until Thursday, July 3, 2014 at 6 PM CT. The giveaway is open internationally. All entrants under the age of 18 must have parental permission to enter. You can enter by following the directions in the Rafflecopter widget posted below (check out this blog post for more information on entering Rafflecopter giveaways). I’ll announce the winner on THIS blog post and KnitCrate will contact them directly through email. Good luck! Congrats to the winner of the June 2014 KnitCrate Giveaway! Your finished cowl is beautiful – the color scheme would be perfect for late summer & all of fall. The Stalking the Wild Blueberries yarn from your June Knit Crate is absolutely beautiful. And every time you talk about your hexipuffs & how you’re going to make a Beekeeper’s Quilt, it inspires me to start one, too. I need to look into that. TFS, as always! It’s a wonderful long term project. There’s even some groups on Ravelry dedicated to it! I really like VeryPink Knits on YouTube for easy to follow tutorials. So love the cornflower blue yarn, and the pattern as well! 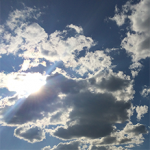 I’m looking forward to seeing your finished project! I’m sure you’ll figure out the ombre yarn add-on! Seems to be the edging trim color! Just subscribed to the Beginners KnitCrate!! I’ve always been a crochet girl, but excited to give this a try. Also ordered the BeeKeepers kit. What a beautiful quilt, I hope I can do it justice!! Your scarf is beautiful. Thank you for getting me excited to try knitting!